Episode 39 Now Up across all platforms. View From The Top Rope delivers a GLORIOUS episode 39 featuring The Ringside Rant. Chad, Diesel and JR make their return to Red's Fortress to give you the greatest podcast in the known universe done by three die hard pro wrestling fans from Wisconsin. This week the episode begins with more news about the newly formed Visionaries Wrestling Network, including a new show announcement and the line up for the first week, #VWN Envisioning Excellence. The boys then move on to The Mystery Brainbuster of the Week, featuring questions from 11 of our "High Flyers" and ranging on topics from all over the wild and wacky world of professional wrestling. We then switch gears and throw the show over to our east coast correspondent RJ, @_ringsiderantRJ, who offers up a scintillating interview with David Fuller, @hXcFuller, owner of IHWE, @IHWEWrestling, so strap in for that. Make sure to Like, Comment, Review, Share and Subscribe and always remember to get up High and enjoy the View From The Top Rope. Episode 40 Now Up across all platforms. View From The Top Rope is officially over the hill and presents to you episode #40. Chad, Diesel and JR come to you from Zeus's Dojo to bring you another amazing episode of the greatest podcast in the known universe done by 3 guys from Wisconsin. The boys begin the show with Visionaries Wrestling Network News, which includes the announcement of another wonderful podcast joining the VWN as well as info from our current slate of podcasts. After we finish up the news we roll right on into The Mystery Brainbuster of the Week, featuring questions from a multitude of our "High Flyers" and really covering a wide array of wonderful topics. After all the questions have been answered the boys switch gears and deliver all their predictions for both NXT Takeover: New Orleans and WWE Wrestlemania 34 to determine the BLTGW Champion plus as always much more fun and frivolity from your favorite #GoodBrothers from Wisconsin. Make sure to Like, Comment, Review, Share and Subscribe and always remember to get up High and enjoy the View From The Top Rope. Episode 41 Now Up across all platforms. View From the Top Rope topé suicida's into your life with episode 41. Chad, Diesel and JR come to you once again from Zeus's Dojo to bring you the most amazing podcast in the multiverse done by 3 #GoodBrothers from Wisconsin. We kick off the show with the wonderful and informative Visionaries Wrestling Network News, keeping you up to date with all the exciting happenings for the network. Next the boys move right along into the Mystery Brainbuster of the Week, featuring a wide assortment of questions & answers sure to enlighten, entertain and maybe even baffle you wonderful "High Flyers". After finishing the wonderful questions from the amazing "High Flyers" the boys switch gears and review their predictions from NXT Takeover: New Orleans and WWE Wrestlemania 34 to see who will be punished and who will become the BLTGW Champion. Plus as always more zany and wacky antics from your 3 favorite #GoodBrothers. Make sure to Like, Comment, Review, Share and Subscribe and always remember to get up High and enjoy the View From The Top Rope. Episode 42 Now Up across all platforms. View From The Top Rope rises from the ashes like a phoenix for a wild and wacky episode #41. Chad, Diesel and JR come to from Red's Fortress to deliver the most reeking of awesome podcast in the known universe done by three #GoodBrothers from Wisconsin. The boys start the show with VWN News to keep all of you "High Flyers" up to date on all the amazing things happening on the network, afterwards Diesel and JR then give a quick rundown of the fun they had at BCW event they attended the past weekend. The boys then switch gears and head into one of the most wild and wacky "Mystery Brainbuster of the Week" in the history of the show, featuring a plethera of answers from the boys sure to make you think/laugh/scratch your head. Plus as always much more fun frivolity from your 3 favorite #GoodBrothers from Wisco. Make sure to Download, Review, Comment, Share and Subscribe and always remember to get up High and enjoy the View From The Top Rope. Episode 43 Now Up across all platforms. 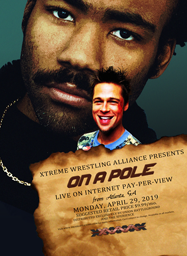 Spring is finally sprung and View From The Top Rope is back to delight you with another amazing episode. Chad, Diesel and JR come to from Zeus's Dojo to give you the most amazing, splendiforous podcast done by 3 #GoodBrothers from Wisconsin in the entire multiverse. This week's episode begins with Diesel and Chad giving a run down of the amazing experiences they had at ICW: Milwaukee and Brew City Wrestling events over the past week, including the details of Chad and Diesel meeting Colt Cobana, Beer City Bruiser, Kevin Sullivan and more. Next the boys move on to everyone's favorite segment "The Mystery Brainbuster of the Week" featuring questions from 11 of our "High Flyers" featuring everything from video game questions to making a new faction on RAW. After the boys actually answer all of the "High Flyers" questions, they move along and give their predictions for the upcoming Greatest Royal Rumble occurring in Saudi Arabia. Plus as always much more fun, frivolity, and wackiness that is sure to delight and entertain any and all comers. Make sure to Download, Review, Share, and Subscribe and always remember to get up High and enjoy the View From The Top Rope. Living on a wing and prayer, View From The Top Rope returns to give you episode 44. Chad, Diesel and JR come to once again from Zeus's Dojo to deliver to you the most amazing podcast in the known multiverse done by 3 #GoodBrothers from Wisconsin. The night begins with VWN News, giving you all the updates and exciting things coming from all of the wonderful podcasts you can find on the Visionaries Wrestling Network. After the news has been given, it is time to move on the fan segment that makes all other fan segments look boring, The Mystery Brainbuster of the Week. This weeks #MBotW features questions from 10 of our amazing "High Flyers" that lead the boys on some interesting sidebars and some answers that will not only inform but also baffle and amaze. When the boys finish all the amazing questions, they move right along into reviewing their picks from WWE's Greatest Royal Rumble and tell you who is going to be getting chopped in the chest. Finally the boys give their predictions for WWE's Backlash to determine if Chad can win the BLTGW Championship back from the reigning champion Diesel, plus as always much more fun and frivolity. Make sure to Download, Review, Share and Subscribe and always remember to get up High and enjoy the View From The Top Rope. Episode 45 Now Up across all platforms. If the podcast is a rocking don't bother knocking and just come on in for this amazing episode of View From The Top Rope. Chad, Diesel and JR come to you once again from Zeus's Dojo to deliver to your the greatest podcast in the known or unknown multiverse done by 3 #GoodBrothers from WI. The boys begin the show with VWN News, delivering to you all the latest and greatest news about all of the amazing content on the Visionaries Wrestling Network. After finishing the news it is time to move into The Mystery Brainbuster of the Week to answer all of our amazing "High Flyers" questions, and spoiler warning there are some doozies this week. After all the answers have been given, the boys give their review of the very unfortunate WWE Backlash PPV and we will apologize in advance for our negativity about it. Make sure to Download, Review, Share and Subscribe and always remember to get up High and enjoy the View From The Top Rope. Episode 46 Now Up across all platforms. The O.G. #Goodbrothers are on a reunion tour to bring you an amazing episode of View From The Top Rope. Chad and Diesel (JR is on assignment) come to you from Zeus's Dojo to give you the greatest podcast in the known/unknown multiverse done by 2 #GoodBrothers from WI. The show this week starts with both Chad and Diesel gushing over their excitement for #Starrcast and #ALLIN and the fact that View From The Top Rope will be included on Podcast Row. After the boys settle down about Starrcast, they move right into Visionaries Wrestling Network News, bringing you all the wonderful updates and information on all the amazing podcasts featured on the #VWN. After the news has been given, Chad and Diesel move right into everyone's favorite segment "The Mystery Brainbuster of the Week" featuring questions from a multitude of our "High Flyers" and covering everything from professional wresting to pop culture, leading the boys on some interesting and amazing tangents, sure to tickle your funny bone and delight your mind. We also offer our heartfelt thank you to all of you "High Flyers" for listening and everything else you do for us in this episode, so make sure to tune in. Make sure to Download, Review, Share and Subscribe and always remember to get up High and enjoy the View From The Top Rope. Episode 47 Now Up across all platforms. The boys are back in town and here to deliver you episode 47 of View From The Top Rope. Chad, Diesel and a returning JR come to you Zeus's Dojo to give you the greatest podcast in the known/unknown multiverse done by 3 #GoodBrothers from WI. The boys dive right into the week by first giving their reviews of their weekend excursions to Brew City Wrestling and Insane Championship Wrestling:Milwaukee, including a special guest to discuss attending ICW: Milwaukee which was their first ever professional wrestling event. After the weekend is discussed its time for Chad and Diesel to deliver Visionaries Wrestling Network News, giving you all the updates on all the amazing podcasts across the entire #VWN. When VWN News finishes up it is time to move into the "High Flyers" favorite segment, The Mystery Brainbuster of the Week and this is the biggest #MBotW EVER!!!! Featuring over 20 questions that span the entire scope of professional wrestling and multiple other topics leading the boys to deliver answers and thoughts sure to delight your mind and tickle your funny bone. Make sure to Download, Review, Share and Subscribe and always remember to get up High and enjoy the View From The Top Rope. Episode 48 Now Up across all platforms. Ridiculous heat, computer issues, and bad beer couldn't stop them and the boys are back for View From The Top Rope episode 48. Chad, Diesel and JR come to you once again from Zeus's Dojo to deliver to you the greatest podcast in the known multiverse done by three #GoodBrothers from Wisconsin about Pro Wrestling. The boys begin the show with Visionaries Wrestling Network News, giving you all the great information for all the great podcasts found on the #VWN including the announcement of a brand new podcast joining the network. After the news has been delivered its time to move into all of you "High Flyers" favorite segment, the Mystery Brainbuster of the Week. This week's #MBotW features over a dozen questions spanning the entire wild and wacky world of professional wrestling, leading to the boys delivering some wild and wacky answers sure to enlighten and delight. Make sure to Download, Review, Share and Subscribe and always remember to get up High and enjoy the View From The Top Rope.